What Even Is a Toyon? Toyon magazine was named by librarian, nature enthusiast, photographer, and beloved mentor, Charles Bloom. After coming to HSU in 1952, he quickly became an active member of the community. He suggested the name Toyon for the just-beginning, student-produced creative arts journal. Although the journal itself has undergone many transformations, Bloom’s influence lasts in the simple and symbolic title that connects the magazine to the local terrain and flora. He even had a piece published an early edition of the Toyon called “Upon Buenos Aires” which consisted of a series of journal entries—an early example of the legacy of creative non-fiction work in Toyon. 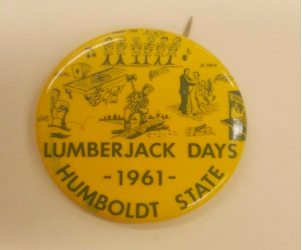 Pin worn by Bloom, Head of Public Services—when he was crowned winner of Ugliest Professor Contest, HSU 5/6/61. He was crowned the winner of the “Ugliest Professor Contest” at the annual Lumberjack Days campus celebration. 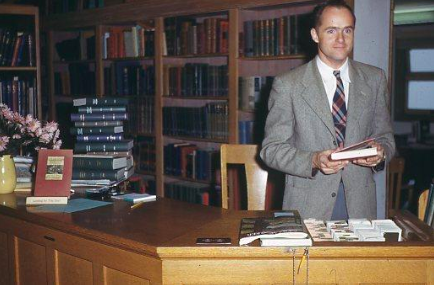 He was well-loved by his students and colleges and kept regular correspondence with fellow librarian, Dean Galloway who described Bloom’s letters saying “the joy, of course, comes from the bits of news couched in Bloomer style” (Galloway). He retired from his work in the library in 1983, but his influence on the Toyon Literary Magazine, in name and in its connection to the natural world, continues on. Bloom, Charles. HSU Library, Staff File. Arcata, 1952-1983. Bloom, Charles. Charles Bloom Slide Collection. Arcata, 1952. Galloway, Dean. Received by Charles Bloom, Iran, 8 Feb. 1957, Tehran.